It is with great pleasure and also with a sense of reverence to Swami Samarth Ramdas that this English translation of his monumental work by name DASBOADH in being offered to devotees not knowing Marathi language, so that they will be acquainted with the comprehensive treatment given by the most practical saint Samarth Ramdas, to the subject of a successful worldly life as well as the path of spirituality. The original voluminous book was, it is told, dictated by the Author to his disciple and various copies of the manuscript were prepared and recorded in various Math s’ of Samarth Ramdas by some of his main disciples. That manuscript is in verse, composed in OVI metre, containing four small lines, the fourth being yet smaller. The book contains 200 chapters, having various number of ‘Ovi’s in each chapter. The book is divided into 20 groups of 10 chapters each, the group is being called ‘Dashaka’ the chapter being “Samasa “. The book is an independent work, and not a commentary on any Sanskrit book existing prior to it. The form adopted is of a dialogue between the speaker who is the Teacher, and the listeners, among whom there are some disciples. Questions are put by them to the speaker and he has given answers. 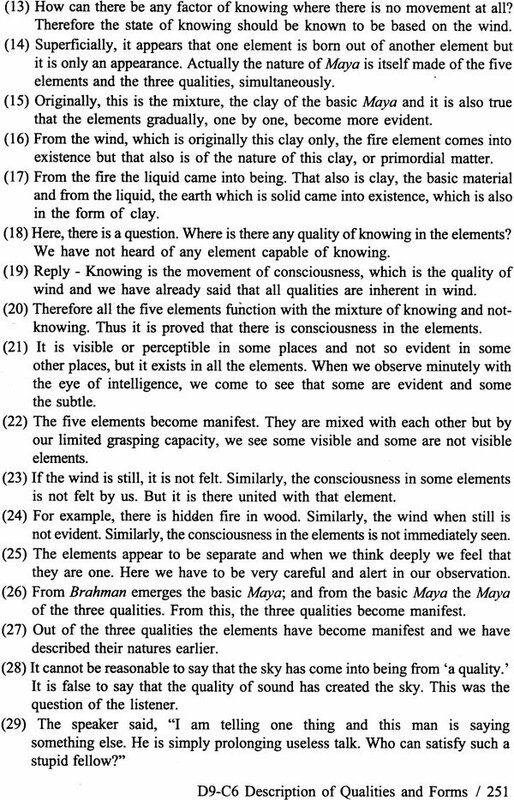 In this English translation, the verses are translated in clear prose, and the number of each Ovi is put in the beginning instead of at the end which is the traditional method followed for poetic presentations of this nature. Thus the readers of this book will get the contents of each OW, in prose form, which will be easy for reading and following the contents. The aim of this English translation is not to present a comparative volume containing both the Marathi text followed and accompanied by English version. So, Marathi text is not given. The book is meant not for critics who are keen on the exactitude of statements; but faithfulness to the meaning which the Great Swami Samarth Ramdas wishes to convey is certainly maintained. Some explanations are, of course, added in brackets for the facility of the readers. The readers who do not know Marathi, but can follow English, are kept in view while doing this translation. The 9th edition of the Marathi book by name ‘Granthraj Dasboadh,’ published Samarth Sewa Mandal, Sajjangadh, Dist. Satara in the year 2002 A.D., edited b Bhaskarbuva Ramdasi, which is according to the copy in Math at Domgaon - is taken for reference, while many books on Dasboadh containing prose meanings and commentaries in Marathi were referred to for comparing their meaning with my interpretations. The original Dasboadh is a compilation of various discourses and dialogues that took place on various occasions over a number of years from 1659 A.D, To 1681 AD, during the life time of Samarth Ramdas and we find some changes, omissions :r additions to the copy of Domgaon Math, in various copies available in Shirgaon Math, Ekkehalli Math and others. I have not totally followed other copies but ‘considered those versions also while translating. Samarth Ramdas was an active political leader with the base of religious revival movement, at the times of Maharashtra history when Moghul emperors were ruling d problem of survival of Hindu religion against the onslaught of political pressures mail reached a very seriuos stage. Samarth was the Guru and guide of the king Shiwaji in his adventures of establishing a Hindu kingdom, which became successful in the year 1674 A.D. Throughout the vast literature produced by Samarth Ranzdas, which is much more, in addition to this Dasboadh, we find messages of positive efforts, discrimination, determination, devotion and practical shrewdness in daily life. In this context Sarnarth is quite different from other contemporary or earlier saints, like saint Tukaram, saint Eknath or the great saint Dnyaneshwar, because those saints have concentrated their literature on mystical, religious devotional and spiritual aspects of life; while, Samarth stands apart as a doyen of socio-political reforms regeneration and reorganization. Perhaps some persons may find similarity in the Mission of Swami Vivekananda of recent times, with the achievements of Samarth Raindas. A short biographical sketch of Samarth Raindas is given with this book, but as the objective of this work is not the detailed biography of the great saint, I have given it briefly for the benefit of readers, so that they will be acquainted with the personality and the achievements of the original author, whose work is being presented into English. 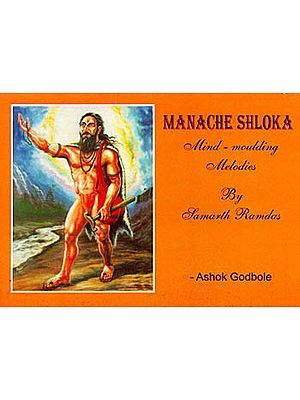 I am aware that for a person like me, the work of translating faithfully the book which is in the Marathi language which was popularly spoken about 300 years ago, and many words and phrases of which are now out of date, is a task in itself, but the blessings of elderly saints, as well as good wishes and help came from all sides. God helps those who help themselves So, this work was undertaken with a humility coupled with confidence and faith in God. I am personally and on behalf of the publishers of this English translation, MIs Keshav Rhikaji Dhawale of Mumbai, much indebted to all the writers and publishers of those volumes and particularly thankful to the Samarth Sewa Mandal of Sajjangadh on this count. 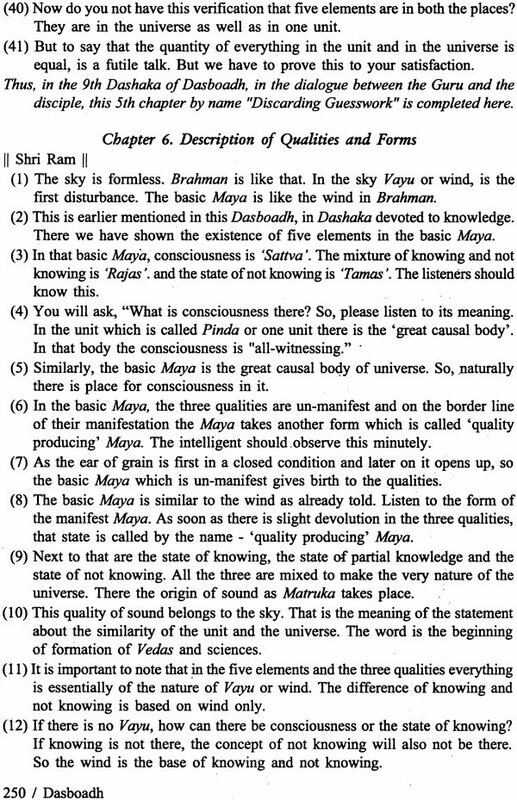 My friend Shri Ram Velapure, from Dombivli who has translated Dasboadh into Sanskrit gave me useful hints as to the necessity of using simple language while taking care to keep as much accuracy of ideas as possible, so that Sainarth Ramdas c meaning is not distorted, Further, my friends, Shri. Keshavrao Kodiyal and Shri, Arvind Sukhtankar have helped me while reading the proofs and given suggestions which were valuable from the accuracy point of view. Miss Kalyani B/rave has tremendously helped me while writing down the manuscript of this English version and my thanks are offered to all the three for their help. Jyoti Dhawale of m/s Keshav Bhikaji Dhawale, publishers has encouraged me to do this work which for me, is a labour of love - nay - a devotional service to the cause of religion. I am thankful to the publishers for all their kindness. m/s Add Typesetters, especially Mr. Aanjaneya Dhawale deserves thanks for tirelessly preparing more than one proofs of the book and doing the typesetting work in a ‘‘eiy presentable manner. For the picture plates and the cover page, I thank Mr. Anil Dabhade and Mr. Aanjaneya Dha wale for the very neat and attractive work they have produced. I am quite aware that there must have remained some spelling mistakes or errors of English idiom, which is entirely my fault for which I entreat forgiveness and whatever good points are there in this humble effort belong to the sources of inspiration who are none else than Prabhu Ramchandra and the saint Sarnarth Ramdas. With these sentiments I present you my kind readers, this book of devotional dialogues between the Teacher and the disciples. It is a pleasure for us to offer this second edition of this English version of Dasbodh of Swami Samarth Ramdas, as the readers’ response for the first edition was encouraging. Some spelling errors which had escaped our notice are now removed, except which nothing as regards the text matter is changed. So, we hope that this second edition will also be patronized by religious readers. English has nearly become the most popular language and when such masterpiece of religious Marathi literature are published in this language the portals of the literature of the whole eorld are opened to the book.